Though it's not a class I've ever seen used in practice, I've always been smitten with the idea of the wild mage -- a magic-user who lives on the dangerous and unpredictable side of the arcane. The only place I've actually seen a wild mage class presented was in the AD&D 2nd edition Tome of Magic. The class didn't appear in AD&D 1e (as far as I know) and also seems to have never made it into the later versions of the game (again, as far as I know -- please correct me if I'm wrong here). This lack is something I hope to remedy by including guidelines for wild magic in my work-in-progress book. 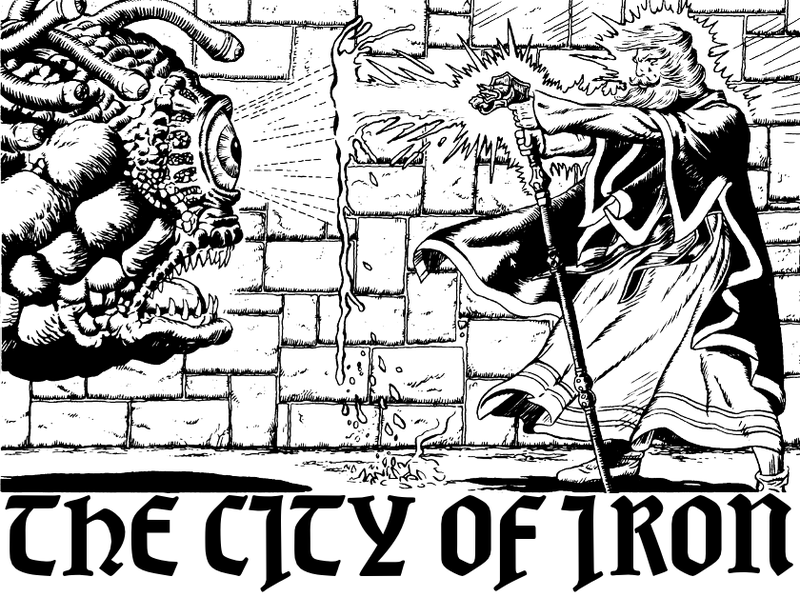 My initial thoughts are going along a different track to the ToM wild mage, which presented a d100 table of (fairly extreme) wild surge effects, with a 1 in 20 chance of a wild surge occurring each time the wizard casts a spell. Personally, I'd like a system where wild surges are more common but less extreme. And instead of the fixed table of effects, I'd like to design a system which taps the endless (d∞!) creative potential of the DM & players. So here are the beginnings of my thoughts on how this might work. Any magic-user can choose to be a wild mage. Usually this choice would be made at character creation, and could never be altered, but existing MUs may be allowed to opt to be wild mages if the DM introduces the option in the middle of a campaign. Magic-user sub-classes like illusionists can also opt to be wild mages (or wild illusionists, in this case). Whenever a wild mage casts a spell, the player must roll 1d6 & 1d12. The d6 determines whether a wild surge occurs, which is indicated by an odd number. If a wild surge does occur, then the d12 indicates what happens. Wild surge, consult table 2. Wild surge, consult table 2. Spell remains in memory (can be cast again). Spell works as intended plus stays in memory (can be cast again). Spell functions as if the caster were 1d4 levels higher than normal. Spell has normal effect plus the effect of a randomly chosen spell of the same level. Spell has normal effect plus another randomly chosen memorized spell is activated unwillingly. Spell fizzles with no effect. The spell's target or area of effect (where applicable) changes. Randomly chosen spell of same level activates instead. Randomly chosen spell of one level higher activates instead. A randomly chosen spell of level d8 manifests instead of the intended effect. The caster loses the ability to cast spells for 1d4 rounds or 1d4 turns (whichever the Labyrinth Lord deems appropriate). So the main creativity of the system comes when the intended effect is replaced by a randomly chosen spell. This would require a lot of quick creative thinking on the part of the DM, which I reckon would be a lot of fun! For example, what happens when a sleep spell surges and is replaced by hold portal?. The intention is that the DM wouldn't have to follow the random spell's description to the letter, but could simply use it as a creative kick-start. In the example of sleep transmuting into hold portal, perhaps there are no doors close by, and the DM could interpret it as locking shut the mouths or eyes of all creatures in range. As I say, this is all just a beginning, so I'd be very interested to hear anyone's thoughts on what I've described or on wild magic in general. The only thing I recall winning in my life up till now was tickets to go and see a theatrical version of "The Hobbit" in about 1985, which I won (as a kid) by entering a competition to colour in a picture of Smaug! However I can now add to that esteemed colouring-in accolade... I just checked out the results of the Fight On! random tables contest and discovered that I've won an "Elite Honorable Mention" for my Magical Research Results table, and won PDFs of all back-issues of Fight On! magazine plus their short stories compilation Roll the Bones! I'm super pleased about this, especially as I don't think I've ever read a single issue of Fight On! before (but have of course been very interested in it), so will now have a glorious quantity of new D&D related reading / material! I think I'll get them all printed and bound into one monster book for my reading pleasure (if they'll fit -- I guess it'll come to hundreds of pages!). I can't wait to see the compilation of all the entries -- there are some extremely intriguing sounding names in there! This rather oblique thought emerged unbidden from my mind this morning and planted itself on a piece of paper. I shall now transcribe it for the edification of the curious. A system which allows one to play Labyrinth Lord with build-your-own classes. Ability scores rolled as normal. All characters progress using the fighter XP table (for the sake of simplicity). Players get 12 points to spend on the options below. Race & class are separate, as per the AEC. I guess multi-classing is out. Saving throws? Not sure... probably just use the chart which seems to fit best. Basic (0 points) -- Magic-user attack chart, d4 hit dice. Moderate (2 points) -- Cleric / thief attack chart, d6 hit dice. Advanced (6 points) -- Fighter attack chart, d8 hit dice. Heavy weapons (2 points) -- Use two-handed weapons, heavy crossbow, longbow competently. Without this technique characters suffer -2 to hit with these weapons. Two-weapon fighting (2 points) -- Fight with two one-handed weapons. Without this technique, two-weapon fighting is not possible. Backstab (2 points) -- Damage multiplier when attacking someone from behind by surprise. The standard thief skills plus any extras allowed (1 point each). Slow advancement (4 points) -- Slow spell progression table (not included), starting from experience level 2. Medium advancement (8 points) -- Standard magic-user spell progression. Fast advancement (12 points) -- Standard magic-user spell progression, plus bonus spells for high INT. Slow advancement (2 points) -- Slow spell progression table (not included), starting from experience level 2. Medium advancement (4 points) -- Standard cleric spell progression. Fast advancement (8 points) -- Standard cleric spell progression, plus bonus spells for high WIS. So I'm back from holiday, twas very nice, albeit rather rainy, but such is the lot of the British Isles. Firstly, I wanted to post the spell list as it stands for my nature mage class. It needs more work, especially at levels 6 & 7, and I also want to go through and compare it (and the new necromancer spell list) against the existing illusionist and magic-user lists, to make sure the balance of attack / defense / misc spells is OK, and that the lists don't contain too many spells which sound really cool but are actually very unlikely to be used in the average adventure (transfer pregnancy? ;) It was inspired by the film Beast Master, by the way). Secondly, if anyone has any ideas for a name for this class please make suggestions! "Nature mage" or "biomancer" are the best I've come across so far, but I feel like the latter sounds a bit too cyber-punk for D&D, and I'd really like a one-word name, rather than "X mage" or "Y wizard", if you know what I mean. (D) denotes druid spells and (MU) denotes magic-user spells, all from the Advanced Edition Companion. The work on my necromancer class for Labyrinth Lord is progressing well, and it feels like the spell list is nearing completion. As a little teaser I thought I'd post the list as it currently stands. I'll probably flesh out the mid to high levels a bit more, but you should be able to get an idea of the kind of things the class is capable of. By the way, I think I didn't mention it before, but all the new spells, classes, monsters, etc in the book are going to be open gaming content. (C) denotes cleric spells, (MU) denotes magic-user spells and (I) denotes illusionist spells, all from the Advanced Edition Companion. Spoiler warning: Players, this is the next level of the dungeon you'll be playing tomorrow! Shield your eyes! 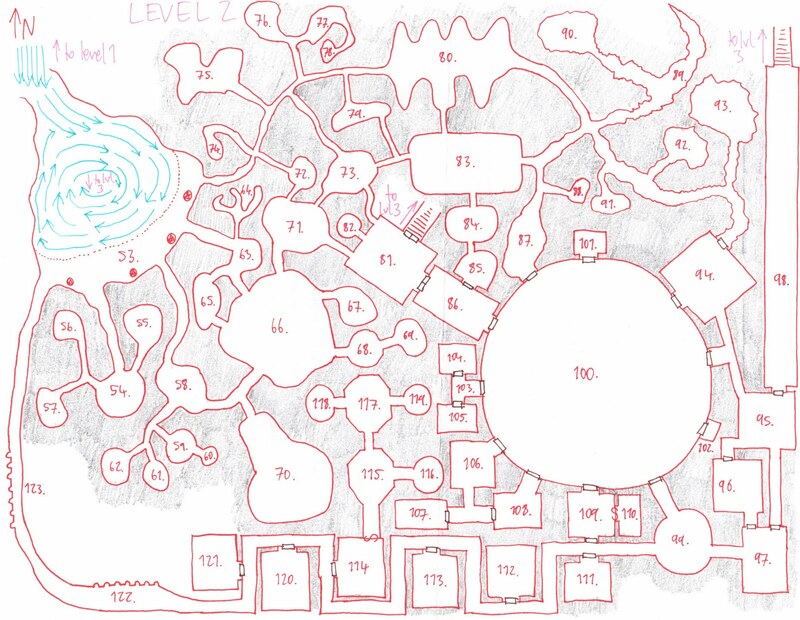 I've never posted any of the dungeon maps I've drawn before, as I have no idea if anyone's really interested in seeing that kind of thing, but I just finished drawing one today and was quite pleased with it so I thought I'd share it. 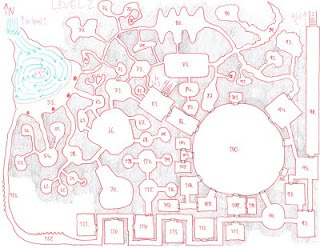 It's intended as the 2nd level of a dungeon, and is keyed with areas 53 to 123 (so, 70 encounter areas). It could of course though easily be used as the 1st or any other level of a dungeon. The main entrance is at the top left, via a set of slippery handholds in the rocks by the waterfall. Two stairways lead down to a deeper level, one in the middle of the map, and one in the top right corner. The whirlpool in area 53 also leads down to the third level. You may note my use ungridded paper, which I find allows for a nice free-form feeling while drawing, and the unusual red / purple colour scheme. I did this once by accident while drawing in low light, and since then have taken it up as a tradition of sorts. If anyone wants to use this map for their own purposes feel free! I just felt like sharing a few of the new spells I've come up with in the process of creating the necromancer class which will feature in my book of magic (the only working title I have so far!). 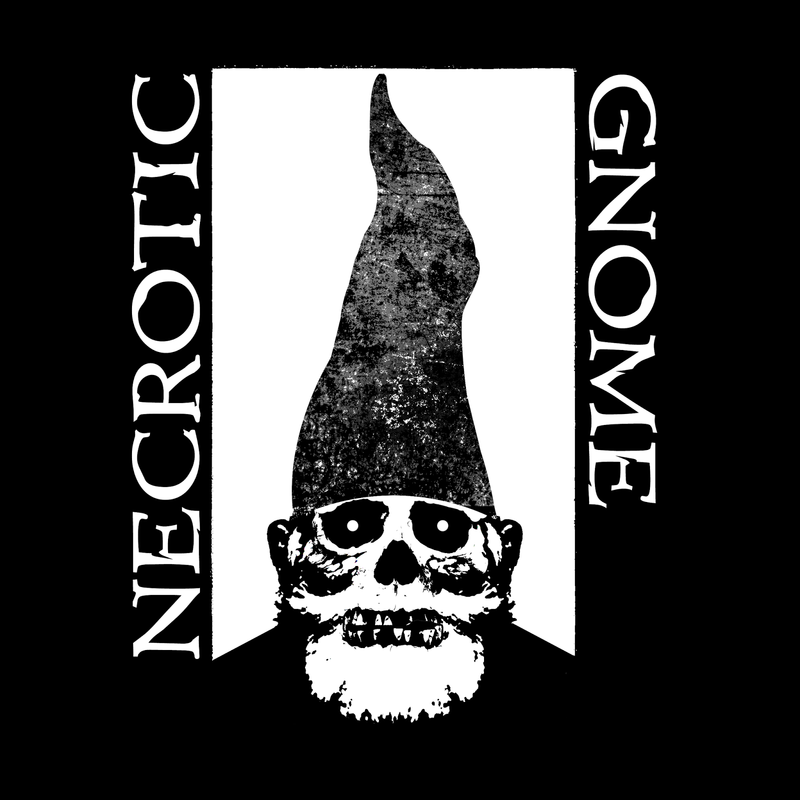 Of course necromancers have been rehashed endlessly in various editions of D&D, so some of the spells in the class' list are fairly familiar, but I'm also making an effort to come up with some original stuff to give it a bit of different twist. Here's a few of the new ones which are (as far as I know!) original. This spell allows the caster to control up to 2d8 HD of recently deceased creatures, reanimating them as undead for a short time. The reanimated dead are mindless and are fully under the caster's control. They fight using their normal stats, having 1d8 hit points, and can be turned as zombies. When the duration expires the deceased fall immediately back into the grip of death. This spell allows the caster to take on the facial appearance of the corpse of someone recently dead (within one week). The caster's face reflects the exact state of the corpse, and will decay as it decays. Nonetheless the spell is often enough to achieve the desired deception. When cast upon a character killed in combat this spell causes them to rise again and continue fighting. The affected character must have died within the last 5 rounds. The risen combatant is not considered undead, and is not controlled by the caster, maintaining their own goals and personality. They will attack to the best of their ability, being immune to fear and possessing an eerie strength, granting +1 to melee attacks and damage. The spell lasts either until fighting stops or the affected character reaches -20 hit points. At this point the character drops to the ground, truly dead. Characters reanimated by this spell suffer a -10% adjustment to their chance of surviving resurrection. I've just finished putting together a document for my players of all the "esoteric equipment" (stuff like drugs, poisons, healing draughts, and so on) that they currently have access to, and some rules for living expenses and various things they can do in towns. I thought I'd share it here, feel free to download the PDF and check it out if you like.